Mississippi’s attorney general sued State Farm on Tuesday for allegedly misclassifying damage to lower the amount they owed policyholders, raising issues similar to what insurers have been accused of doing with auto insurance estimates. Jim Hood, a Democrat whom “Anderson Cooper 360” reported has also been critical of auto insurance tactics, sued the No. 1 insurer to recover the tab State Farm allegedly foisted on Mississippi by improperly calling covered wind damage flood damage. 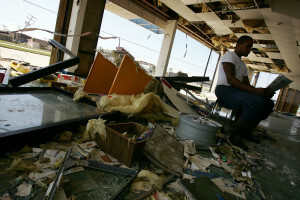 “We are still reviewing the lawsuit filed earlier today, which was not expected considering what we have done in resolving claims as a result of Hurricane Katrina,” State Farm spokesman Phil Supple said in a statement reported by the Associated Press and published on ABC News’ website. Flood damage wasn’t covered by the kind of policies thousands of Mississippi residents used to recover from Katrina, and so the state created a Homeowner Assistance Program to help them with it and other rebuilding. But millions in damage costs shouldn’t have been the state’s burden, according to Hood — State Farm should have paid it off under the terms of wind coverage, he said. “State Farm caused Mississippi to pay hundreds of millions of dollars that the State otherwise could have allotted to other recovery efforts,” the Attorney General’s Office said in a news release. His office noted that a jury already found that State Farm forced an engineering company to alter a damage report that way. State Farm has appealed that ruling, according to the AP, and alleged that the plaintiffs stole company documents. As for auto insurance, Hood has also requested a federal investigation into alleged car insurance “steering” and parts requirements, the Mississippi Business Journal reported in March. Hood was also planning a lawsuit similar to one in Lousiana over car insurance practices, “Anderson Cooper 360” reported in February. Collision repairers have made similar accusations against insurers, including that they’ve denied non-excluded repair procedures to save money or instructed independent adjusting agencies how to write an estimate.